Is PennDot verdict an opening for non-union builders? They say yes. Not so fast, says Johnny Doc. A legal fight delayed PennDot’s repaving of U.S. 202 down Markley Street in Norristown for two years. Nonunion contractors say their recent court victory signals the waning power of union leaders and a new era in construction growth. One big shift came with late January’s indictment of union leader John “Johnny Doc” Dougherty, which could remove labor’s most politically powerful leader. Other changes include Montgomery County Democrats’ fumbled efforts to steer contracts to union allies and nonunion contractors’ counter-push to win projects in Philly. Factor in the Republican-led Commonwealth Court’s block on PennDot pro-union bidding rules, and the Wolf administration’s failure to appeal that defeat to the Democratic Supreme Court (including Dougherty’s brother and political beneficiary, Justice Kevin Dougherty). “It’s all tied together," says Joe Perpiglia, president of the nonunion Associated Builders and Contractors in eastern Pennsylvania. PennDot will now rebid Markley Street without insisting on a union-management project labor agreement (PLA). To Perpiglia, that’s another step in reversing “what’s been going on for 35 years,” a period in which he says “fearful” contractors cowered before union leaders who pressed politicians to give taxpayer-assisted work to union employers, though it cost more. 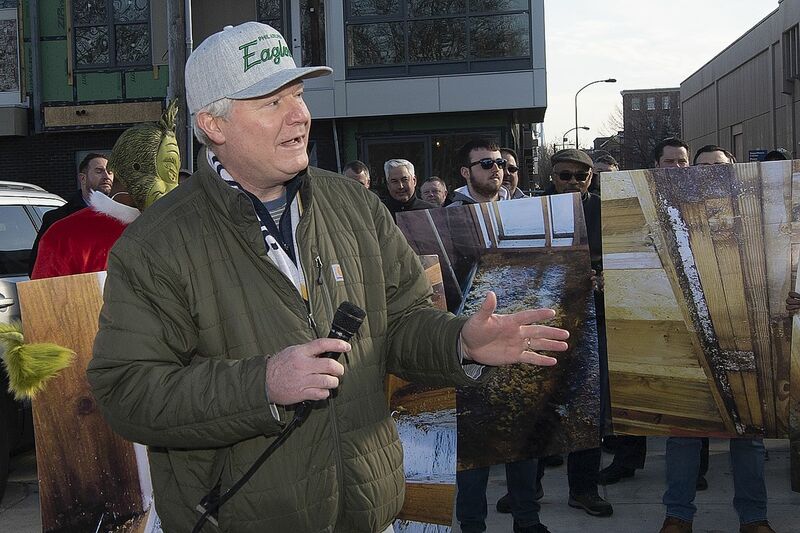 Nonsense, says Dougherty, who, despite his legal troubles remains business manager for the Philadelphia Building & Construction Trades Council union group. To Doc, the Markley Street case was just a one-off. The state’s attempt to require a labor agreement “was an overreach.” He still looks forward “to working closely with Gov. Wolf and Mayor Kenney on many more PLAs that guarantee fair wages, safe job sites, and projects that are delivered on time and on budget." Wolf sent a similar message. “We also look forward to a time when Associated Builders and Contractors members no longer use day workers” and pay taxes like other employers, Dougherty added in a parting shot. How much do your members plan to save by paying less? I asked Perpiglia. It’s not about wages, he said. Nonunion labor in metropolitan areas is paid about the same hourly rates as union workers. The issue is more about benefits. Union medical and guaranteed-pension plans cost more — increasing labor costs by about one-third — versus the cheaper commercial health insurance and optional retirement savings that nonunion bosses offer. The nonunion contractors say they’re on the side of the have-nots: Millennials and minority workers have a better chance at construction jobs if white, suburban union members aren’t guaranteed work, Perpiglia’s group says. I told Perpiglia it seemed to me that it’s the predominantly African American Laborers’ union whose jobs are first in danger if Philly switches to “open-shop” or “merit-shop” hiring, as in Wilmington, where subcontractors hire immigrants to do site-prep, street-paving, and other basic construction jobs. Perpiglia says his contractors are planning a recruiting event soon “near North Philadelphia” to find more nonunion, Philly-based, African American workers. Markley Street does seem to have been a strange hill to fight on. Nonunion contractor J.D. Eckman of Atglen, Chester County, had paved a neighboring stretch of 202 for the state, on budget and ahead of time, before the Wolf administration changed the rules, requiring union workers. He told the court it seemed unfair to have to give up the job, or change the way he operates, by hiring union workers at government’s demand. The judges also challenged PennDot’s odd determination to give special consideration to members of the United Steelworkers union, a power in Pittsburgh but rarely seen at building sites here. “I agree with the lower-court decision and I’m happy it was not appealed,” Tony Wigglesworth, head of the Philadelphia Area Labor Management Committee, which administers PLAs, told me. PLAs aren’t so much for street-paving jobs; they mostly cover big, complex projects that need fast dispute resolution between bosses and workers, he said. The biggest-ever Pennsylvania state building project, the $800 million Pennsylvania Convention Center expansion, was completed on time and on budget under a PLA. (By contrast, the second-largest state project, the $400 million Phoenix prison beside the old Graterford facility in Montgomery County, was rebid by then-Gov. Tom Corbett to avoid a PLA and was finished 2½ years late, after epic bickering between the state’s hired construction agents and its general contractors. About $35 million in state payments are still in dispute. Wigglesworth said big private companies such as Texas-based Energy Transfer Partners use PLAs on major jobs such as the conversion of Sunoco’s Marcus Hook refinery to a natural-gas processing center. The initial PLA at that site kept 1,200 union pipe fitters, boilermakers and other trades busy from 2014 to 2017, and finished on budget and on time, Wigglesworth says, even though original general contractor CB&I was replaced by Fluor Corp. partway through. Energy Transfer has agreed to another PLA for a second large project at Marcus Hook under a national labor-management agreement that should employ a similar number of union workers, Wigglesworth added. And that, he concluded, is the big story on construction labor: Away from the headlines, skilled union workers are still building the biggest projects around.